This book introduces the resources of contemporary social system theory, as pioneered by the German sociologist Niklas Luhmann and associated theorists. Luhmann’s theory is very different from the general systems approach that dominated sociological thought for several decades after the Second World War. Norms and functions are not seen as fundamental premises of social systems and social order. Rather meaning, communication, and observation are set into the core of social life and its analysis. Meaning is seen as a medium that couples psychic and social systems or consciousness and communication. Observation is described as the introduction of distinctions and selections, and communication is the basic operation that connects observations and thereby allows for the emergence of observers: persons, interaction systems, organizations, and functional subsystems of society, such as the economy, politics, law, and art. Society itself is conceived as the encompassing unity of all communication, a universal set of references that makes observation and communication possible. Modern system theory does not join the quest for essential variables such as norms, values, or institutions. It selects observations and depicts their connectivity, their potential for processing information, building expectations about meaning in the world, and for structuring social systems. Contemporary social systems theory tries to explain the probability of the improbable: that communication occurs and reproduces a universe of meaning in which observers may orient themselves. Social system theory incorporates fresh insights from cognitive biology, the philosophy of consciousness, phenomenology, distinction theory, socio-cybernetics, and constructivism to explain the emergence of society. The authors of Observing Society describe how the theory moves beyond traditional sociological paradigms that attempt to explain social order and understanding with presumptions of intersubjectivity, collective conscience, communicative rationality, or normative consensus. This theory of society presents itself as the key to what Niklas Luhmann called a “sociological enlightenment” that will bring social thought out of “the Dark Ages” of anthropocentrism, social ontology, and normative social philosophy. Traditional sociology presents a quagmire of competing grand narratives; none of which offers a generally useful or scientific concept of the unity of society. In this book, Lee and Brosziewski demonstrate that sociologists can use the same concepts from social system theory to describe very different aspects of society, even while describing how the distinctions they employ are limited, contingent, and self-referential. Dispensing with the old grand narratives and profiting from recent advances in diverse fields of inquiry, contemporary social system theory extends the reach and increases the descriptive power of sociological discourse and, as a consequence, promises to increase the discipline’s plausibility as a science, its research productivity, its connectivity with other disciplines, and its resonance with the public. 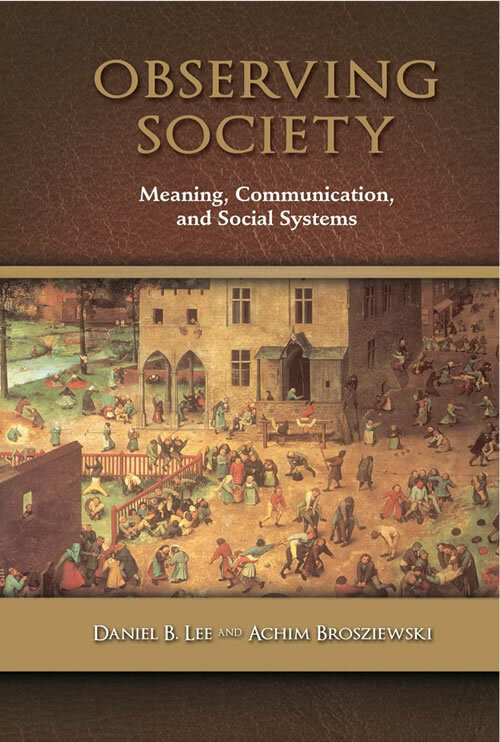 Observing Society: Meaning, Communication, and Social Systems concisely outlines how social system theory offers sociologists an integrated set of practical and general analytical concepts, a promising agenda for scholarly inquiry, and a cutting-edge description of modern society. Using clear illustrations and effectively citing original material previously unavailable in English, Lee and Brosziewski carefully explain the logic of drawing distinctions to make observations, the concepts of meaning and communication, the forms of communication media such as speech and writing, the evolution of forms of organizing society, the functional differentiation of modern systems, and how social system theory informs sociological research and methodology. This book will hold significant relevance for collections in sociology, philosophy, German studies, European studies, and culture and media studies.